The volume of credit in Belgium has risen over the past few years. Despite the increased attention given to alternative finance methods, banks remain the main suppliers of credit in Belgium. The National Bank of Belgium (NBB) reported that the outstanding amount of used credit (granted to non-financial institutions) is, at the start of 2018, more than €130 billion.2 Febelfin, the Belgian Financial Sector Federation, reported that the amount of credit granted is currently at a record high, while the borrowed amount slightly decreases.3 According to a European Central Bank (ECB) survey published in November 2017, Belgian small and medium-sized enterprises do not regard access to credit as their main concern.4 Interest rates continue to be low,5 which explains why many corporate borrowers have sought to refinance their outstanding credit. In Belgium, banks often use either their own templates to document loans or, depending upon the loan size and deal structure, LMA-style6 documents may also be entered into. The Belgian legislator is continually trying to improve access to credit and has adopted new laws regarding (1) the financing of small and medium-sized enterprises, and (2) the security rights regime relating to movable assets. Belgian banks are seeking to protect their profits against the costs of the implementation of ever-changing regulatory requirements. For this reason, Belgian loan documentation (both the banks’ own templates and the LMA-style documentation) often contain a clause on increased costs that often have the same effect as the increased-costs clause in the LMA templates. Such an increased-costs clause passes the costs resulting from changes in the law or regulation, including the implementation or application or compliance with Basel III or CRD IV, on to the borrowers. The Belgian law dated 21 December 2013 concerning the financing of small and medium-sized enterprises entered into force in 2014 (the SME Financing Law) and has recently been revised by the law of 21 December 2017. This law offers certain protection to SMEs since they often have significantly less bargaining power than the truly large companies: for example, professional lenders must act reasonably and in good faith and they must inform the SMEs adequately about the loan’s terms and conditions. The SME Financing Law also contains certain restrictions on break costs. The ambiguity regarding the SME Financing Law’s scope was rectified by the Law of 21 December 2017, stating that the SME Financing Law does not apply if one of the borrowers is not an SME or if the borrower is part of a group that, on a consolidated basis, does not qualify as an SME.7 This interpretation is in line with the Belgian legislator’s intention when adopting the SME Financing Law: namely protecting real SMEs that have very little bargaining power; not the SMEs that form part of a large group and can depend on the experience, know-how and bargaining power of the group when negotiating a credit agreement. The security rights regime regarding movable assets has been modernised. The Belgian Law of 11 July 2013 on security interests over movable assets finally entered into force on 1 January 2018 (the New Belgian Pledge Law). A royal decree implementing the new law and establishing the rules regarding use of the national online pledge register was published on 14 September 2017 and entered into force at the same time as the New Belgian Pledge Law. The main feature of this New Belgian Pledge Law is that there are two methods to perfect a pledge over movable assets and make such a pledge effective against third parties: either the pledge is registered in the new pledge register (the New Pledge Register) or the pledgor transfers possession over the pledged assets to the pledgee or a third-party pledge holder. The pledge over the business (kind of floating charge) can no longer be granted only to entities with an EEA banking licence and registration costs of the pledge have fallen significantly. As a general rule, Belgian tax law provides a withholding tax on interest payments, but certain exemptions apply. For example, Belgian domestic law provides for an exemption from withholding tax on interest payments made by qualifying Belgian companies in favour of credit institutions (banks) located in the European Economic Area or in a state that has concluded a double tax treaty with Belgium. Interest paid upon a borrower’s loans is tax-deductible provided that certain conditions are met. Generally speaking, these conditions include the following: (1) the lender must be a third party; (2) the borrowed money must be used by the borrower to earn income from its business; and (3) the interest may not exceed market rates (taking into account the borrower’s specific situation). Certain bank documents executed in Belgium, including loan or credit facilities agreements entered into by banking institutions or agreements creating a security interest in favour of banking institutions, are subject to a €0.15 stamp duty. Mortgage agreements and mortgage mandates are subject to various taxes and fees. Pledge agreements over movable assets that are registered with the New Pledge Register are subject to certain registration rights (see Section IV). c Council Directive 2014/107/EU of 9 December 2014 amending Directive 2011/16/EU as regards mandatory automatic exchange of information in the field of taxation. The Belgian Law of 16 December 2015 regulating the communication of information regarding financial accounts, by the Belgian financial institutions and the Belgian Ministry of Finance, related to the automatic exchange of information at the international level and for tax purposes has implemented the international acts stated above and provides for a framework for such an automatic exchange of information. Belgian financial institutions, such as banks, falling under the scope of this law will need to report and retain certain information on the reportable accounts held by them to the appropriate Belgian authority, while at the same time protecting their clients’ privacy. A security interest can be created over movable assets (tangible and intangible) and immovable assets (real estate) located in Belgium. A consensual security right over land, buildings or other immovable property located in Belgium is created by entering into a mortgage deed. Such a mortgage deed must: (1) be executed in Dutch, French or German before a notary; (2) be registered with the tax authorities; and (3) be recorded in the appropriate mortgage registers of each judicial district in which the mortgaged real estate is located (as there is no central mortgage register). Since the costs associated with a mortgage are very high and calculated on the basis of the amount secured by the mortgage, security providers will often request limiting the amount secured by the mortgage and to cover a significantly higher amount by a mortgage mandate (which is not a security interest, but only a power of attorney to create additional mortgages). A pledge over specific tangible or intangible movable assets is currently easy to establish in practice following the entry into force on 1 January 2018 of the new Belgian Law of 11 July 2013 on security interests over movable assets, introducing a new title in the Belgian Civil Code (the Pledge Law). Since 1 January 2018, a pledge over movable assets may be perfected by registering such a pledge in the Pledge Register (therefore, the transfer of possession is no longer required, but it remains possible to perfect a pledge by a transfer of possession). As a result, it has become much easier to create and perfect a pledge over specific tangible or intangible movable assets. Depending on the amount secured, the registration fee for a pledge can range between €20 and €500 and between €12 and €300 to make a change to the registration in the Pledge Register. The pledgor retains possession over the assets constituting the business and may sell the assets in the ordinary course of business so that the pledgor can keep on running its business in a normal fashion. The pledge can cover all the assets that constitute the business of the pledgor including, among other things, the total value of the inventory, the clientele, goodwill, commercial name and signs, commercial organisation, trademarks, patents, know-how, rights under leases, furniture, commercial records, equipment and vehicles – land and buildings are excluded. Following the entry into force of the Pledge Law, the Law of 25 October 1919 on business pledges has been abolished. A business pledge that has been validly created and perfected before 1 January 2018 will remain valid and enforceable, but it will become ineffective unless it has been registered in the Pledge Register within 12 months after the Pledge Law enters into force (i.e., at the latest by 31 December 2018). This registration can be made in the same way as a new pledge registration and is free of charge. Existing business pledge mandates will still allow establishing pledges that will be subject to the new rules introduced by the New Belgian Pledge Law. The Belgian Law of 25 October 1919 on business pledges (the Business Pledge Law) allows creating a pledge over the business of a commercial company. The pledgor retains possession over the assets constituting the business and may sell the assets in the ordinary course of business so that the pledgor can keep on running its business in a normal fashion. The business pledge covers all the assets that constitute the business of the pledgor including, among other things, the clientele, goodwill, commercial name and signs, commercial organisation, trademarks, patents, know-how, rights under leases, furniture, commercial records, equipment and vehicles. Certain movable assets are only covered if expressly agreed between the parties. Land and buildings are excluded and only 50 per cent of the value of the inventory may be subject to the business pledge. A business can only be pledged if it qualifies as a business as referred to in the Business Pledge Law. A business pledge can only be granted to an entity having an EU banking licence as referred to in Article 7 of the Business Pledge Law. Since the costs associated with a business pledge are very high and calculated on the basis of the amount secured by the business pledge, security providers will often request limiting the amount secured by a business pledge and covering a significantly higher amount by a business pledge mandate (which is not a security interest, but only a power of attorney to create additional business pledges). Following the entry into force of the New Belgian Pledge Law, the Business Pledge Law will be abolished. A business pledge that has been validly created and perfected before this entry into force will remain valid and enforceable, but it will lose its rank unless it has been registered in the New Pledge Register within one year of the New Belgian Pledge Law entering into force. This registration can be made in the same way as a new pledge registration, although it is not yet certain which costs, if any, will apply. Existing business pledge mandates will still allow establishing pledges that will be subject to the new rules introduced by the New Belgian Pledge Law. A pledge over registered shares must be registered in the share register of the company whose shares have been pledged, and this company must be notified of the pledge or acknowledge the pledge. A pledge over book-entry securities (for example, shares or other financial instruments held through the Euroclear system) is perfected by transferring possession of the shares: the shares must be booked into a specific pledged account held by the pledgee or a person representing the pledgee. A pledge over receivables or bank accounts is only enforceable against the debtor of the pledged receivables or against the account bank once the debtor or the account bank has been notified of or has acknowledged the pledge. Perfection of a pledge over intellectual property rights will depend on the type of rights to be pledged: certain pledges must be notified to, or registered with, the relevant IP authorities or registration offices to become effective against third parties. Under Belgian law, certain types of security interest may only be validly created in favour of the creditors of the secured claims and cannot be held by a person acting on behalf of a fluctuating body of creditors. As a result, a Belgian security interest is often created in favour of a security agent acting in its capacity as an independent creditor of a parallel debt. A parallel debt structure is not required regarding (1) a pledge created over financial instruments, such as shares or bank accounts, as such a pledge may be created in favour of a security agent acting as a representative for one or more lenders and (2) a pledge over other movable assets (tangible or intangible) in favour of a security agent acting as a representative for a fluctuating body of lenders. There are several types of guarantees available in Belgium, and parties can modify a guarantee according to their needs. For example, a guarantee can be an independent guarantee or an accessory suretyship. A guarantee can also be callable on first demand. A bank guarantee will often be callable on first demand and be independent from the underlying debt documents. A guarantee may also be unlimited or be provide for a maximum amount. Guarantees, especially upstream or side-stream guarantees, will often be limited to lower the risk that the granting of the guarantee would not be within the corporate benefit of the Belgian guarantor (see Section V). Given the general rule under Belgian law that creditors should be treated equally upon a debtor’s insolvency, a person can no longer set off its debt against the receivable of another person following the insolvency of the latter. There are certain exceptions to this rule: statutory netting may occur if certain conditions are met (for example, the receivables must be closely connected) and contractual netting will, as a rule, also survive the insolvency of one of the parties (unless the netting agreement has been entered into during a ‘hardening’ period). The LMA clause that all payments an obligor makes must be made without set-off or counterclaim is generally deemed to be valid under Belgian law. Belgian bank lending documentation will most likely include negative pledge undertakings. Such an undertaking, however, will probably (this is subject to debate) not affect the security interest granted by an obligor breaching such a negative pledge undertaking provided that the beneficiary of the security interest was acting in good faith. Mortgage mandates are used to limit, or at least postpone, the costs related to a mortgage or business pledge. Such mandates are irrevocable powers of attorney to establish additional mortgages or business pledges, but do not create a security interest effective against third parties and do not give any right of priority to the banks. A mandate cannot be used to create a mortgage or a business pledge following the security provider’s bankruptcy or during a ‘hardening’ period preceding the bankruptcy. a Creditors rank equally, unless a creditor benefits from a lien or a security interest as provided for by law. b Certain creditors, such as the creditors for certain judicial costs and the creditor for costs made to maintain or preserve assets, benefit from a super-priority lien and will always rank ahead of other creditors. c Creditors benefiting from a specific lien (for example, a pledge or a mortgage) will rank ahead of the creditors benefitting from a general lien (for example, the tax and social security authorities that benefit from a statutory lien). d In the case of competing security interests, the security interest that has been made effective against third parties first will often have priority. Subordination can be achieved contractually between creditors, through an intercreditor agreement or a subordination agreement. Such agreements are often entered into between the senior creditors, the junior creditors and the debtors. The subordination of claims secured by certain security interests may require that certain formalities are complied with regarding the security interests. Belgian opinions are normally in line with foreign practice. Belgian opinions contain various assumptions regarding matters of fact and foreign law. These assumptions include matters of fact relating to the conclusion of an agreement (such as no violation of public order or vitiated consent); the capacity of the Belgian companies entering into the transaction documents (for example, regarding corporate benefit); the assets secured by a Belgian security interest (for example, regarding ownership); financial assistance; and the genuineness and accuracy of the examined documents. A Belgian legal opinion will typically include several qualifications. These qualifications may cover the following subjects: insolvency; corporate benefit and corporate purpose; change of control clauses; the security agent acting as trustee; parallel debt; financial assistance; perfection of security interests; ranking of security interests and other liens; novation; choice of law and choice of forum; recognition of foreign judgments; rules of procedure; and enforcement. A commercial company subject to Belgian law must enter into a transaction with the intent of pursuing profit. This is a rule of public order. If a company enters into a transaction without the intent of pursuing profit, then the company’s entry into such a transaction will be invalid. Whether or not a company intends to pursue profit is a factual matter. In addition, the directors of a company subject to Belgian law have a duty to act in the company’s corporate benefit. If a Belgian company enters into a transaction that does not fall within the company’s corporate benefit, the validity of the transaction could be challenged. The rules existing under Belgian law regarding a company’s corporate benefit do not contain well-defined guidelines, and the proper application of any such rules depends on the business issues affecting such a company, which can only (and must) be properly assessed by its board of directors. Whether or not a transaction is to a company’s corporate benefit is a factual matter. the risks incurred by the guarantor or security provider (for example, the value of the encumbered assets and the amount guaranteed by the company) are proportionate to (1) the benefit it derives from the transaction, and (2) its financial capacity. The granting of downstream guarantees or security interests will generally (but not always) present fewer problems from a corporate benefit perspective. It would be more challenging, however, to satisfy the corporate benefit test when granting upstream or side-stream guarantees or security interests. If a Belgian subsidiary is required to guarantee or secure the indebtedness of the other group companies in the context of a group financing, then the amounts guaranteed or secured by the Belgian subsidiary will often be limited to try to ensure that the security interests or the guarantee are proportionate to the Belgian subsidiary’s own benefit derived from the transaction and the Belgian subsidiary’s financial capacity. A Belgian company may not advance funds, grant loans or provide guarantees or security interests to facilitate the acquisition of the shares held in that Belgian company (for example, a Belgian company may not secure the loan that is used by the borrower to finance the acquisition of the shares held in that Belgian company), unless the procedure as set out in Article 329/430/629 of the Belgian Code of Companies is met. This ‘whitewash’ procedure is very strict and cumbersome and not often relied upon in practice. One of the requirements is that the financial assistance must be paid out of, and cannot exceed, the distributable profits. Given these requirements, in our experience it is often not possible to rely on this procedure. The provisions of an agreement that confer or may confer rights on third parties affecting the assets and liabilities of a Belgian company incorporated as a public limited company or a partnership limited by shares, or that create a debt or an obligation of such a company when the exercise of these rights depends on the issue of a public takeover bid on the shares of the company or on a change of the control over the company, must be approved by the company’s shareholders. The shareholders’ resolutions approving the change-of-control clauses must be filed with the relevant commercial court’s clerk’s office. As there is no established concept of ‘trust’ or ‘trustee’ under the present Belgian legal system, Belgian legal opinions will normally not advise on the precise nature, effect and enforceability in Belgium of the security agent’s duties, rights and powers as a trustee or on the performance or exercise of such duties, rights and powers. As stated above (see Section IV), Belgian security interests are often created in favour of a security agent acting in its capacity as an independent creditor of a parallel debt. Although a parallel debt structure is often used and generally accepted by Belgian legal scholars, legal opinions will often include a (light) qualification as to the validity of such a structure as there is no conclusive case law on this matter. The choice of Belgian or foreign law to govern the contractual aspects of the transaction documents will generally be accepted under Belgian law, subject to certain qualifications. As a rule, these qualifications are derived from Regulation (EC) No. 593/2008 of the European Parliament and of the Council of 17 June 2008 on the law applicable to contractual obligations (Rome I) or, if the Rome I Regulation does not apply, then the Belgian Law of 16 July 2004 regarding the code on private international law. For example, the application of foreign law may be refused if it is manifestly incompatible with Belgian laws of public policy or effect may be given to overriding mandatory Belgian law provisions. A security interest will be subject to the laws of the jurisdiction in which the secured assets are located. A jurisdiction clause giving jurisdiction to the courts of Belgium or a foreign jurisdiction will generally be accepted under Belgian law, unless an exclusive ground for jurisdiction applies. The applicability of an exclusive ground for jurisdiction depends on several factors including: the subject matter of the proceedings; the chosen forum; and the domicile of one of the parties. An exclusive ground may be found in different legal acts, including the following: (1) Regulation (EU) No. 1215/2012 of the European Parliament and of the Council of 12 December 2012 on jurisdiction and the recognition and enforcement of judgments in civil and commercial matters (recast) (the domicile of the parties is not relevant for this Regulation if parties have agreed a forum); (2) the Lugano Convention on jurisdiction and the recognition and enforcement of judgments in civil and commercial matters signed at Lugano; (3) Regulation (EU) No. 2015/848 of the European Parliament and of the Council of 20 May 2015 on insolvency proceedings; or (4) the Belgian Law of 16 July 2004 regarding the code on private international law. For example, parties may generally not freely choose the forum regarding proceedings related to: insolvency; the constitution, the nullity or the dissolution of companies or other legal persons or associations of natural or legal persons; the rights in rem for a certain property; entries into public registers; or the registration or validity of intellectual property rights. A final and conclusive judgment handed down by a court of competent jurisdiction outside Belgium is recognised and enforced by the Belgian courts subject to and in accordance with one of the following legal acts (depending on the jurisdiction of the court that rendered the judgment): (1) Regulation (EU) No. 1215/2012 of the European Parliament and of the Council of 12 December 2012 on jurisdiction and the recognition and enforcement of judgments in civil and commercial matters (recast); (2) the Lugano Convention on jurisdiction and the recognition and enforcement of judgments in civil and commercial matters; or (3) the Belgian Law of 16 July 2004 regarding the code on private international law. For example, a foreign judgment will not be recognised or enforced if it is manifestly contrary to public policy in Belgium. Belgian legal opinions covering enforceability are typically given by lenders’ legal counsel. Often, but not always, the Belgian capacity legal opinions will be delivered by borrowers’ legal counsel. 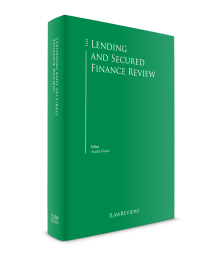 We have noticed that lenders’ legal counsel are increasingly requested to deliver full legal opinions covering both capacity and enforceability. An exception is being made for legal opinions delivered in the context of a US bond offering, as in that case the issuer’s Belgian legal counsel will often deliver the full legal opinion. Loans in Belgium may be traded in different ways, including through novation, assignment sub-participations, securitisation or synthetic methods. The guarantees or security interests securing a traded loan will, as a rule, continue to exist, but in some cases certain measures must be taken. For example, if a loan is transferred through novation, liens and mortgages will only continue to exist if the parties have specifically agreed that the liens and mortgages will not cease to exist following the novation. Certain formalities may also need to be complied with such as the registration of the transfer of a mortgage with the mortgage registry or a pledge created under the New Belgian Pledge Law with the New Pledge Register. New lenders and other secondary-market purchasers may benefit from a Belgian security interest through different mechanisms. A Belgian security interest securing a parallel debt will also, indirectly, secure a new lender’s participation. The lenders will, however, have a credit or insolvency risk against the security agent that is the creditor of the parallel debt. It is also possible to create a pledge over financial instruments such as shares or bank accounts in favour of a security agent acting as a representative to one or more lenders, including new lenders and other secondary-market purchasers. Following the entry into force of the New Belgian Pledge Law, the security agent is also able to act as such a representative regarding a pledge over other movable assets (tangible or intangible). Professionals dealing with secured lending in Belgium were looking forward for some time to the entry into force of the New Belgian Pledge Law, which was published in the Belgian State Gazette on 2 August 2013 and finally entered into force on 1 January 2018. Following the usability of the New Pledge Register, action should be undertaken to have existing business pledges registered in the New Pledge Register in the course of 2018 and at the latest by 31 December 2018. Alternative finance methods, such as bond issues or crowdfunding, are hot topics among finance professionals and the Belgian legislator has tried to accommodate such methods. However, bank lending is likely to remain by far the most important source of financing in Belgium in the coming years. 1 Yves Brosens is a partner and Britt Vanderschrick is an associate at ALTIUS. 22 NBB, ‘Credit granted to resident non-financial corporations according to the Central Corporate Credit Register’, https://stat.nbb.be/Index.aspx?DataSetCode=CCR (consulted on 8 May 2018). 3 Febelfin, ‘Krediet aan ondernemingen bereikt recordbedrag van bijna 148 miljard EUR’, 8 March 2018, https://www.febelfin.be/nl/krediet-aan-ondernemingen-bereikt-recordbedrag-van-bijna-148-miljard-eur (consulted on 8 May 2018). 4 ECB, ‘Survey on the access to finance of enterprises in the euro area’, November 2017, https://www.ecb.europa.eu/pub/pdf/other/ecb.accesstofinancesmallmediumsizedenterprises201711.en.pdf?beb1832df4af9efa945a5a1f7b99eeb7 (consulted on 8 May 2018). 7 Articles 2 and 3 Law 21 December 2017 amending the law dated 21 December 2013 concerning the financing of small and medium-sized enterprises; see the Minister of Finance’s response dated 27 January 2014 to question 0678-53.